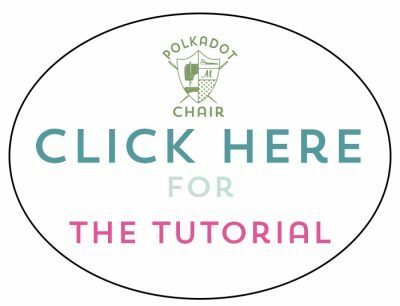 I hope you’re ready to play along with the Block of the Month series here on the Polka Dot Chair! 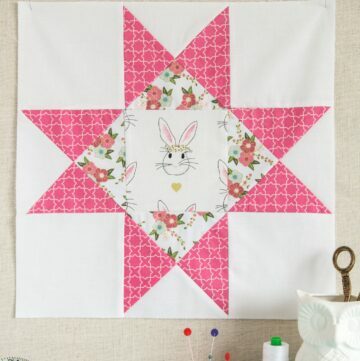 This month we are continuing the series with a String Half Square Triangle Quilt Block. This is block #4 of 12. 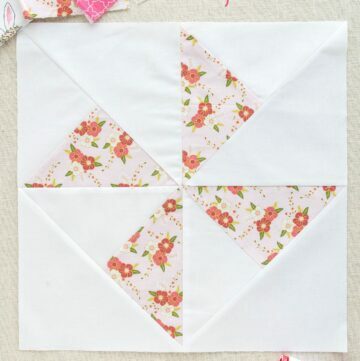 It builds on the basic HST blocks that we learned to make in October and adds an extra dimension by piecing them from a strip pieced block. 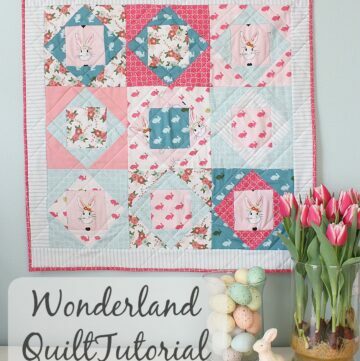 If you missed it be sure to check out this post offering tips and trick to picking out fabric for a quilt. 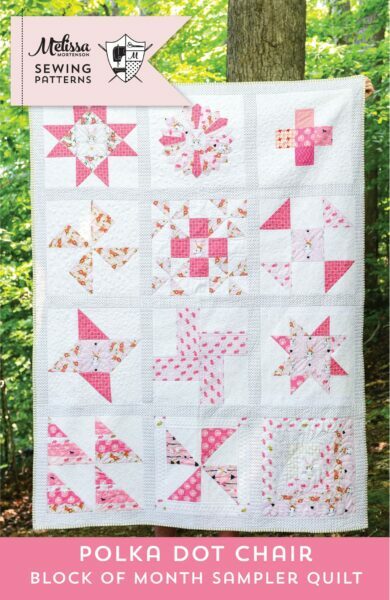 You can find an index to all the posts in this quilt block series to date by clicking here. Hi There!! Did you guys have a nice Christmas?? Are you ready to jump back into creating now that the Holidays are over? 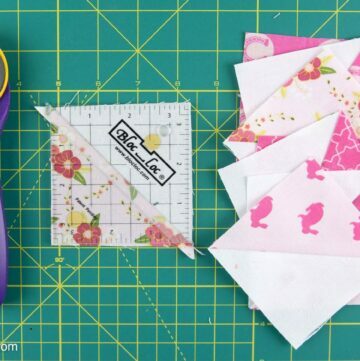 Maybe you set a goal for yourself in 2016 to learn to quilt or to complete a specific project? I’ve set a few goals for myself that I’ll be sharing with you in the next few weeks, but before we jump into all of the New Years Resolutions stuff, let’s mark that December Quilt Block of the Month, this String Half Square Triangle Quilt Block, off of our “to do” list shall we? You’ll notice that this months block is illustrated versus photographed. I’ve had a few camera related problems the last two weeks and didn’t get them fixed in time for this post. I knew a few of you guys would be anxiously awaiting the block this month and didn’t want to make you wait any loner, so I went ahead and illustrated the block for you instead. Rest assured that I’ve made 4 of these blocks to make sure that all of the math and measurements are correct. I’ll probably share a sneak peek on Instagram later today if you want to follow me over there. UPDATE: The photos have been posted you can check them out on this POST. I’ll pop in here next week (the camera issues are now resolved) and share with you photographs of the finished blocks along with a few updates of how I’m doing finishing up some of the blocks from the previous months. 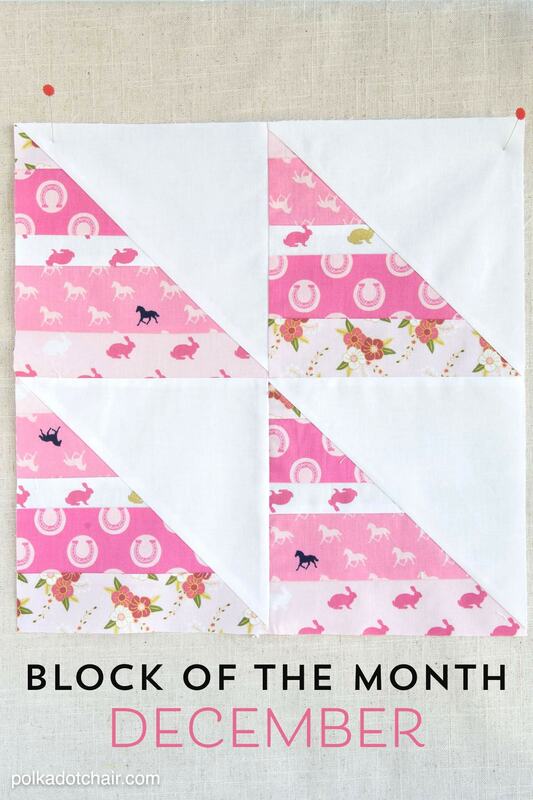 This months block is a variation of the Half Square Triangle (HST) blocks that we learned to make in October. The variation is that it is made partially with a string (or stripe) block. The block is also set 4 up and I like that it will make the finished quilt look like it’s made up of smaller blocks as well as the larger finished blocks. excellent and i could assume you are a professional in this subject. updated with coming near near post. Thanks a million and please carry on the gratifying work.